Coolsure was selected to participate in GSMA’s Mobile Energy Efficiency (MEE) Optimization case study in Pakistan in 2013, where Coolsure UTS-55W High Efficiency AC/DC split-type air conditioning units were trialed along with trials for deep cycle batteries and methanol fuel cells. Baseline performance was measured on 10 BTS sites across various geographies in Pakistan, and thereafter the Coolsure UTS cooling system was installed and trialed on 2 of these sites. The high efficiency of the Coolsure UTS cooling system demonstrated energy savings of >55% compared to the existing cooling system, which represents over US$2.6 million savings in annual utility bills if implemented across all the indoor BTS sites in the operator's network. Many regions in Pakistan are subject to extended AC power outages and rolling blackouts. The Coolsure UTS-55W is capable of operating at high efficiency from the existing 24V or 48V battery during AC power outages, allowing the diesel genset starting to be delayed without risk of the BTS site overheating. The UTS-55W DC cooling capability resulted in a 3 hour reduction in diesel generator runtime per day on average and represents a reduction in diesel fuel usage of approximately 1,839,600 liters per annum across the operator's indoor BTS sites. The tremendous utility and generator savings provided a compelling business case with a payback period of less than 2 years, resulting in deployment of 200 units in the first phase rollout. In 2017, a trial was conducted at a Tower Co’s typical BTS site located in Teshie, Ghana to compare the energy consumption and performance of the Coolsure UTS-36W High Efficiency AC/DC Telecom Split Air Conditioners against existing air conditioners. Replacing existing low efficiency air conditioners at end of life with Coolsure’s High Efficiency air conditioners provides an excellent business case, with payback period based on savings in electricity bills usually less than 1 year. For indoor sites with frequent/long AC power outages, Coolsure High Efficiency AC/DC air conditioners can provide backup cooling while powered from the batteries, allowing the genset start to be delayed and reducing the genset runtime. For completely off-grid indoor BTS sites, Coolsure High Efficiency AC/DC air conditioners facilitate alternative powering solutions, such as solar or hybrid. Coolsure solution demonstrated a 71% savings in cooling power, with estimated annual savings 12,912 kWh (equivalent to USD 5,832) for the trial BTS site. A Malaysia based telecom operator was experiencing hot spots and excessive energy consumption at one of their small data rooms. They elected to replace their existing cooling system with Coolsure's high efficiency modular redundant cooling system, comprised of twelve Coolsure ETS-55W air conditioning units. Coolsure air conditioning units were deployed in a hot aisle/cold aisle configuration and arranged to work as a team, with active load sharing between cooling units. The Coolsure cooling solution provided better cooling distribution and eliminated the hot spot problem, while reducing the average cooling system energy consumption from 28kW to 8kW, providing a less than 2 year payback period. To help the operator verify the energy savings and track the savings against the initial business case assumptions on an ongoing basis, the Coolsure Sentinel remote monitoring system was installed. Together with the built-in energy metering functionality of the Coolsure ETS-55W air conditioning units, the Coolsure Sentinel remote monitoring system provides the operator with monthly reports of energy usage and trends, as well as total energy savings since installation, confirming the true utility savings achieved. The Coolsure Sentinel remote monitoring system also contributed to lower the annual service costs of the cooling system. Air conditioning units require regular service to filters and coils in order to maintain peak cooling performance and energy efficiency. Optimum service intervals are affected by the environmental conditions in which the units are operated. By analyzing the historical logs of the Coolsure ETS-55W air conditioning unit's performance, Coolsure technicians determined that the factory recommended interval between services could be extended without detrimental effect, thus reducing the annual service costs. 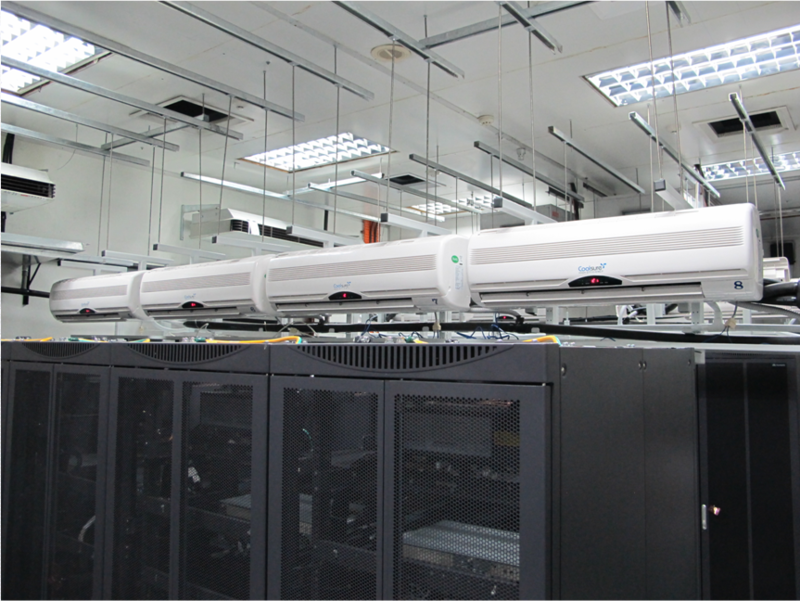 In Indonesia, Bakrie Telecom selected five modular Coolsure UTS-55W air conditioners to replace their existing precision split cooling units for a test trial at a MSC site. The Coolsure UTS-55W air conditioners not only provided >60% energy savings and uninterruptible cooling during power failures, they were also at a lower CapEx than the replaced precision units. Due to zoning restrictions it was not possible for Bakrie to install back-up diesel generators at a number of sites in their network. 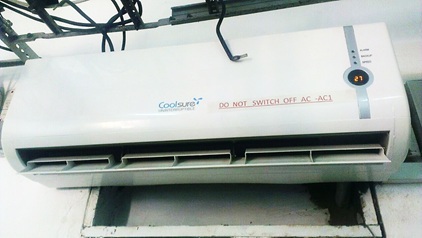 The ability of Coolsure UTS-55W air conditioners to be powered from the backup batteries ensured these sites would not overheat during lengthy AC power outages - particularly critical for their BSC and Hub sites, where the loss of one site could cause a number of connected sites to go down. The low energy consumption of the Coolsure UTS-55W air conditioners minimised the additional load on the batteries, allowing the sites to remain fully operational during extended power outages. The tremendous energy savings and backup cooling capability provided a compelling business case. 150 Coolsure UTS-55W air conditioners were deployed in the first phase rollout, saving an estimated 4,500 MWh per annum and keeping Bakrie’s critical sites cool during power outages. In a trial in Indonesia, two Coolsure UTS-55W air conditioners working in tandem with a Coolsure ECS-2000 free cooling unit were installed at an existing off-grid BTS shelter site, powered by twin diesel generators each run on 12-hourly rotation. 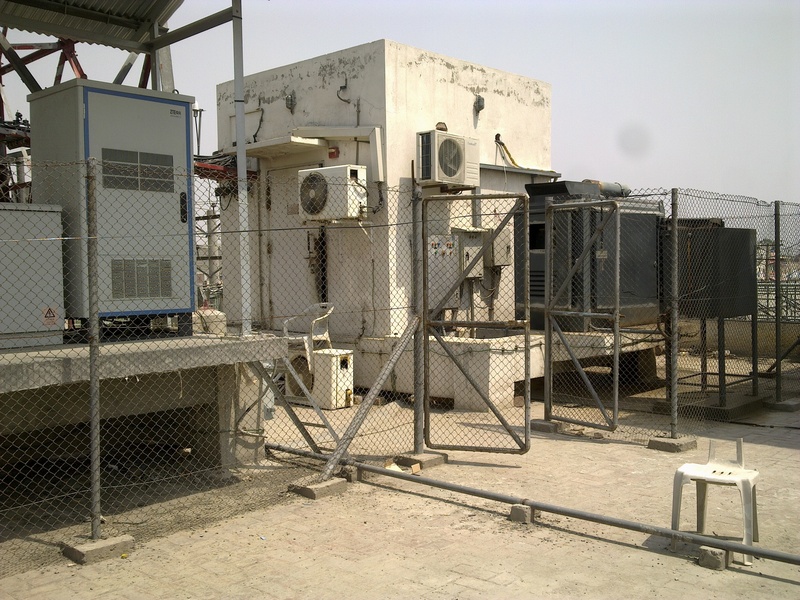 While the telecom equipment was able to operate from the batteries for a period of time, the existing AC powered air conditioners could not, requiring a diesel generator to be running at all times to power the air conditioners and prevent the site from overheating. The low energy consumption, and the ability of both the Coolsure UTS-55W and ECS-2000 systems to be powered from the batteries, enabled the replacing of one of the diesel generators with a large battery bank and the conversion of the site to a charge/discharge system. Coolsure’s low power hybrid cooling solution only contributed a fraction of the total site load, minimising the cooling system load on the batteries and maximising the time between generator run cycles – key to maximising diesel fuel savings. Charge/discharge powering solutions require a significant capital investment in batteries. Coolsure’s combination active and passive cooling solution ensured the optimum environment for long life and reliability of both the batteries and telecom equipment, despite the high outdoor temperatures and humidities routinely encountered at the site. The reduction in cooling system energy consumption and ability of Coolsure’s cooling solution to operate from the enlarged battery bank, facilitated a 76% diesel generator run time reduction, and reduced annual diesel fuel consumption by approximately 12,000 litres per site. The operational cost savings generated from the solution provided a less than 18 month payback period. 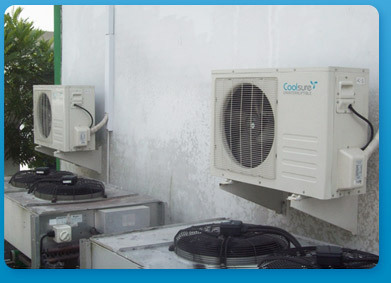 In Malaysia, a leading mobile operator deployed Coolsure’s ECS-2000 free cooling unit at 800 of their BTS shelter sites. 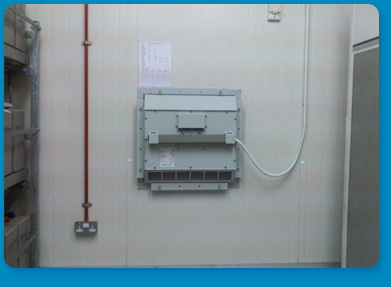 Although free cooling is not ideally suited to the hot/humid Malaysian climate, Coolsure ECS-2000 incorporates enthalpy (humidity) control, allowing safe deployment in humid areas without risk of the humidity inside the shelter exceeding prescribed limits and damaging the telecom equipment. 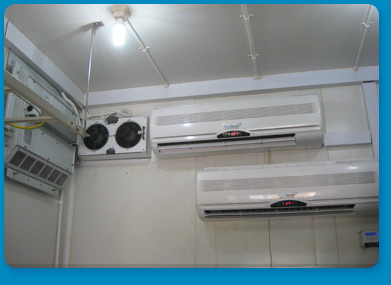 The Coolsure ECS-2000 was configured to work together with the existing twin residential comfort split air conditioners, which were only activated when free cooling was unable to maintain shelter conditions within the specified range. The temperature in the shelter was raised to 35C, allowing free-cooling for a significant portion of the time and providing a controlled trade-off between reduction in reliability of the telecom equipment and life of the batteries and cooling system energy savings. Coolsure’s ECS-2000 free cooling solution reduced the run time of the air conditioners by up to 80% and provided a 75% cooling system energy saving. The intial rollout of 800 Coolsure ECS-2000 systems is providing the operator with an estimated cumulative energy saving of 7 MWh per annum, while keeping their network cool.